Have fun in the sun with a purple picnic! The sun is shining, the sky is blue and it’s not raining (for once! ), it’s the perfect weather for a picnic! 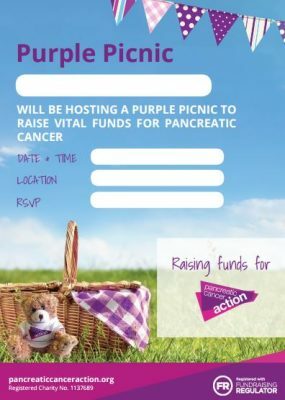 Why not hold a PCA Purple Picnic and help fundraise for Pancreatic Cancer Action. Get together a group of friends, family or colleagues and get outside. You can also let people know on social media too! Choose somewhere that is going to be easy for people to find and get to. You will also want somewhere that’s going to be big enough for the number of people that are coming. Then let people know with our downloadable posters. 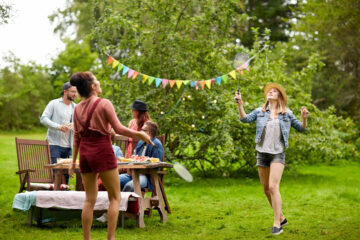 It’s always worth checking local bye-laws of any public parks you are considering as a venue. Having a purple theme is a great way to help people feel involved. Wear some purple clothes, get a purple rug, you can even make some purple food (You can get some PCA cake toppers here). Have a look at our supporter items from our shop. Try giving each of your guests an item/type of food to bring. If it’s a hot day don’t forget to bring enough water to keep hyrdrated. 5. Have fun and play games! There are lots of ways you can fundraise for Pancreatic Cancer Action this summer! Take a look at our Summer Fundraising Ideas to get you started!